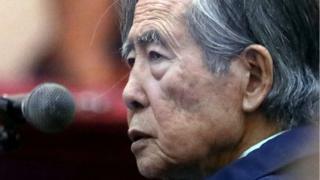 A court in Peru has reversed a pardon granted to the country's ex-president, Alberto Fujimori. But a court ordered him back to jail after a victims' group won an appeal against the decision, made by then-president, Pedro Pablo Kuczynski. His daughter Keiko, who leads the main opposition Popular Force party, told reporters the decision was "inhuman" and "unjust". Most Peruvians had assumed Fujimori, now 80, would be in prison for the rest of his life after being sentenced to 25 years in 2009, having been convicted of ordering the killings of 25 people by a government-backed death squad during Peru's internal conflict. Mr Kuczynski, who resigned in March over a vote-buying scandal, gave him a pardon the same month, prompting protests in Lima - even as Fujimori's supporters celebrated outside the city hospital where he was being treated. The pardon was widely seen as part of a political deal. Mr Kuczynski had narrowly avoided impeachment, with the support of Fujimori's supporters, three days earlier. Carlos Rivera, who is representing victims' family members, said the decision to reverse the pardon "re-establishes the right to justice for the family members of the victims". But his critics say he is a corrupt dictator who was rightfully jailed for ordering the killings of innocent peasants.